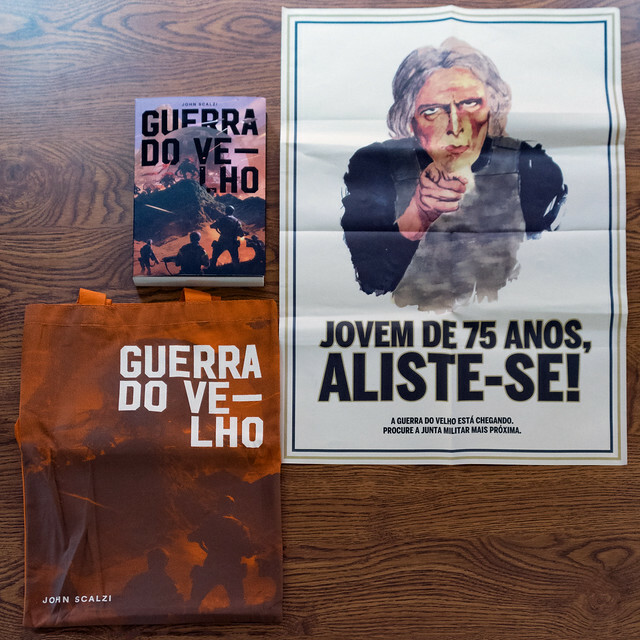 Old Man’s War recently came out in Brazil as Guerra Do Velho, and is apparently doing pretty well there, I suspect in no small part thanks to the efforts of publisher Editora Aleph, who made some nice swag for it, as you can see here along with the books itself. I especially like the poster. Fun fact: The artist for Guerra Do Velho is Sparth — who you may recall is also doing the art for this book of mine. This is pretty nifty. 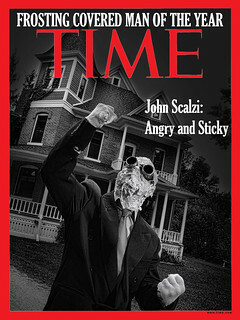 Also, if you want to see the full cover artwork, here you go. I don’t speak Portuguese, but I’m wondering why the hyphen and split line, and why the split is not between the L and the H. What’s logical in English may not be logical in Portuguese, so I’m curious. So, it sorta works out as: War of old him. Sorta. Thus, the likely postitioning of the hyphen. Also not a Portuguese speaker, but I believe the lh bigram in Portuguese represents a single phoneme, approximately analogous to the consonantal “y” in English–velho thus being pronounced sorta like “veyo”. 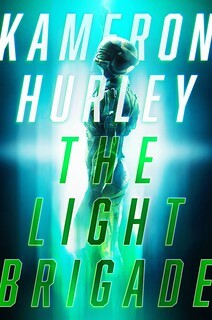 But what I really wanted to say, I’m digging the Guerra cover art. You can tell exactly which scene is portrayed–which isn’t too common, at least not in my experience. Usually it’s some sort of generic mood-setting piece that doesn’t map to a particular incident in the story. I’m guessing this isn’t available in the US? Because it’s awesome and I’d love some of my own. Portuguese speaker here. Velho in this context means old man, so it’s a super literal translation. “War of the old man” (Do is a combination word of de and o so it means “of the”, and this signifies that velho is being used as the noun “old man”, not the adjective “old”). And yes, lh is pronounced more or less y, though there’s a bit of an l sound in there too. Closer to velyo than veyo. Also the double rr is something like a very hard h.
Also, I have never wanted book swag as much as that tote bag. Good job to your Brazilian publisher! Brazilian here. We do get a lot of the newer YA science fictional stuff translated to Portuguese here but there is a huge gap in modern SF for adults that, it now seems, started being bridged by Ready Player One being translated here a couple of years ago. More often than not it feels like SF ignores Brazil and vice-versa. While I’m very fond of Aleph’s long(ish) running effort in getting Portuguese translations of some of the classics of SF (Clarke and Asimov had some very high quality editions from them, so did LeGuin a while ago) back in print, I’m happy to see them try to begin to catch up to more modern SF in their catalog… Unless I’m mistaken their most up to date translation was Stephenson’s Snow Crash, or maybe one of Gibson’s Sprawl trilogy (I’m sure they did Neuromancer, can’t remember if they did the rest of them). Happy that it’s OMW too, even if I didn’t like it much I have to acknowledge: it’s the kind of adventurous novel that has the potential to make a big splash here and hopefully help open doors to some of the local talent. Also very fond of seeing what I’m assuming to be Americans (sorry if I’m assuming wrong) who actually know Brazilians speak Portuguese and not Spanish. It hasn’t been that long (is 5+ years long?) since I’ve been surrounded by some American work colleagues, corp types of the IT variety, who were 100% sure that Spanish was, if not THE official, at least one official language in Brazil. Here’s hoping this is not just some sort of sample bias (although I do suspect the readers here to be more aware then their average compatriots). My apologies if it seems insulting to anyone, it’s just such a relief (and it sure was insulting having foreigners tell me what language I should soeak). I don’t speak Portuguese, but I do speak French and Spanish, though not as fluently these days as I used to. «Guerra do Velho» is literally, Guerra = (the) war, + do = of the, + Velho = (the) old man. The LH is likely considered a single letter for alphabetization, as is the case in Spanish with CH, LL, Ñ, RR. In Spanish, it would be (La) Guerra del Viejo. In French, (La) Guerre du Vieux. — However, I’m at a complete loss why they hyphenated the word in a headline title on a book cover or poster, as that’s really, really strange by any national preference. They should’ve added a line break so it flows nicely with no hyphen. After all, the “LHO” ended up on the next line with plenty of room for the entire word. Or they could have made “do” (of the) smaller, as it’s a minor function word, just like we might make “of the” smaller in such cases. The length of that hyphen looks more like an en-dash or em-dash, besides, but it’s probably the hyphen in that font. Portuguese and Spanish sound and look very different from each other, but they are as close as Spanish and French in the Latinate (Romance languages) family tree. They’re sisters or cousins. Technically, you could argue that “old man” should be plural in the translation, but it’s both a choice of real meaning and of stylistics, and the original American English title shows the author’s intent, so “Old Man’s War,” (an, one, the) old man, wins out. This makes it a singular and specific old man’s war, or any old man, not just old men in general, which gives a stronger bite to the title. One thing in the translation puzzles me: “Joven” in Spanish means a young man, a teenager or older teenage boy, closer to high school and enlistment age. I think they’re using it ironically and on purpose in the phrase, “Joven de 75 ans,” which is smart but a little jarring. And as Brazil is the largest South American country, that’s quite a nice, big market to tap with the book series. John, do you know if the Brazilian OMW is being released in Portugal as well? A bit off-topic, but Ta Nehasi Coates just described Old Man’s War was one of his favorite recent books. High praise from one of today’s great writers and a winner of a Genius Grant.